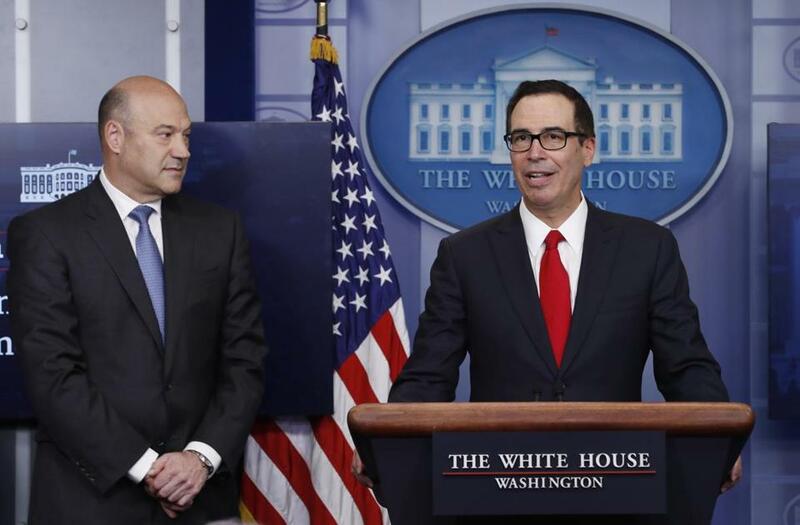 Treasury Secretary Steven Mnuchin, joined by National Economic Director Gary Cohn, spoke about President Trump’s tax proposals at the White House Wednesday. Economists Anne Case and Angus Deaton have reaffirmed an epidemic of shattered dreams — since the millennium, middle-class whites are dying at sharply increased rates. The victims are the least educated; the primary killers drugs, alcohol, and suicide; the triggers ill health and financial distress. Formerly secure Americans — many supporters of President Trump — are suffering death by class. Ironic, then, that Trump’s budget slashes programs for the most vulnerable while, as a candidate, he embraced tax cuts for the rich. Yet the top 1 percent already receive roughly 22 percent of our national income, and hold the same percentage of our wealth — triple their share 30 years ago. A major reason is tax cuts. Over the last 50 years, our top income tax rate fell by 40 percent. As the wealthy thrive, assets held by the poor and middle-class decline. In macroeconomic terms, shifts in income to the wealthy slow consumption, while political power flows to those who have the most and, too often, care the least. In short, that’s the Republican donor class. Within the GOP, their ethic rules. Trump’s half-finished, half-baked tax plan, cutting corporate rates from 35 percent to 15 percent, also applies to private businesses that are now subject to the upper rate for individuals of 39.6 percent. This not only benefits small businesses but also hedge funds, partnerships, and real estate empires like Trump’s — an enormous giveaway to the wealthy. Moreover, Trump’s proposal would benefit the affluent by repealing the estate tax and the alternative minimum tax while reducing taxes on investments. Trump further proposes reducing the income tax brackets from seven to three — 10 percent, 25 percent, and 35 percent — while reducing most deductions. Though we still await further specifics, during the campaign he promised “massive” middle-class tax relief as well as deep cuts for the top 1 percent. 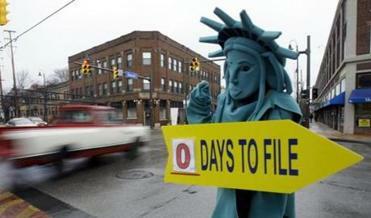 As of now, his middle-class tax relief is modest — an increase in the individual deduction. Treasury Secretary Steven Mnuchin has pledged to offset tax cuts for the rich by eliminating loopholes and deductions. But does he truly think billionaires carry home mortgages? And principals such as House Speaker Paul Ryan and budget director Mick Mulvaney oppose substantial tax cuts for anyone but the wealthy. The GOP’s passion for tax cuts also belies its pose as a party of deficit hawks. Already, Representative Mark Meadows, the leader of the Freedom Caucus, allows that future tax cuts need not be fully paid for. They won’t be: as he well knows, slashing rates for the wealthy while balancing the budget and preserving entitlements — as Trump has promised — is fiscally impossible. Thus, the upper-income tax cuts Trump proposed in 2016 would explode the deficit — by $5.3 trillion over 10 years, according to the bipartisan Committee for a Responsible Federal Budget. Similarly, his corporate tax cuts alone would add over $2 trillion, which, in his proposal, is not offset by revenue from the so-called border adjustment tax. Sure to follow would be a rise in interest rates and the cost of federal borrowing. And any meaningful GOP attack on the deficits would require slashing entitlements, perhaps through privatization — a longtime ambition of Ryan’s. Mercifully, for now Trump and his party appear stalled on the final particulars of income taxation. Their failed health care law already conferred large tax cuts on the rich; by drastically shrinking health benefits for everyone else, it also created a spending reduction which, under budgetary procedures, laid the predicate for further and permanent upper-income tax cuts. Stymied, Trump has proposed passing an even more draconian health care law, which would advance these goals. So how do Republicans mask all this catering to the wealthy as a social good? They invoke the tax fairy, that mythical figure who turns tax cuts for plutocrats into a boon for all. Their mythology involves fantastical projections of increased gross domestic product which, mystically supercharged by the tax fairy, compensates for revenue lost through tax cuts. Trump’s pipe dream is sustained economic growth of 3 to 3.5 percent, a figure no serious economist in either political party believes, and with good reason — five decades of economic history demonstrate that top–bracket tax cuts do not foreordain significant economic growth. In the early 1960s the highest marginal rate was 91 percent and the average annual growth in GDP 4.5 percent. In the ’70s, that rate declined to 70 percent, and GDP growth fell. On average, GDP remained stable in the ’80s, when Reagan drastically lowered rates, and in the ’90s, when Clinton raised them. When George W. Bush lowered the rates again, average GDP growth fell, only to rise after Obama’s tax hikes. Instead, experience shows, they balloon deficits. Reagan slashed the upper rate by 42 percent; the deficit increased by $1.86 trillion. George W. Bush cut the rate by 4.5 percent; the deficit increased by nearly $6 trillion. The cause in both cases is worth remembering now — large tax cuts coupled with increased military spending. So who benefits? Trump donors like the tax-phobic, hedgefund multibillionaire Robert Mercer, Steve Bannon’s funder at Breitbart, and his daughter Rebekah, who bankrolls a super PAC airing pro- Trump ads — symbolic of a group that claims it is beset by “class warfare” inflicted through the tax code. Another billionaire rebukes this specious plaint: “There is class warfare,” Warren Buffett retorts, “but it’s my class, the rich class, that’s making war, and we’re winning.” And Trump’s followers, betrayed by their faux-populist hero, will be among the casualties.